Dive into this collection of 160 large-print crossword puzzles from bestselling puzzle creator Douglas Fink—perfect for hours of fun! 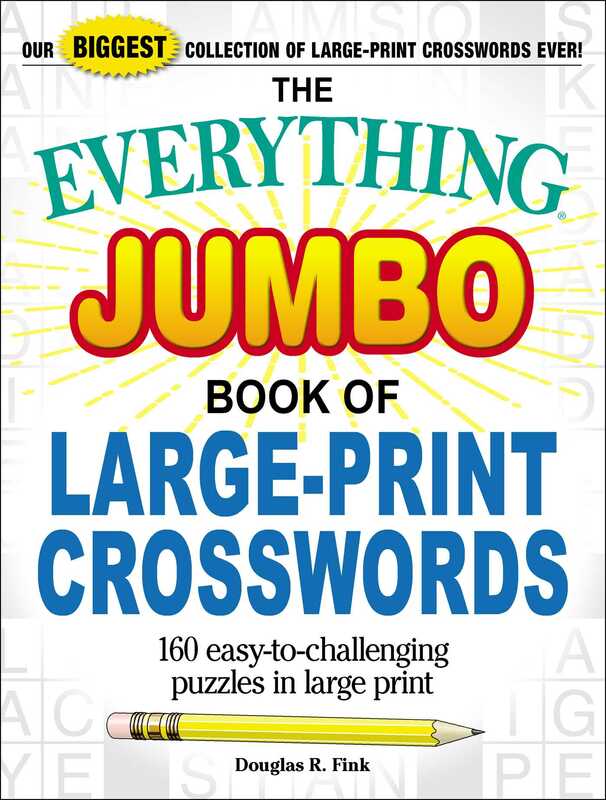 The Everything® Jumbo Book of Large-Print Crosswords is the biggest collection of large-print crossword puzzles yet! Each oversized puzzle is spread out over two large pages—perfect for puzzlers weary of that notorious small type and tight spacing in many crosswords books. Packed with 160 puzzles in an easy-on-the-eyes format, this collection features crosswords in a wide variety of themes, including sports, popular culture, books, TV characters, animals, vacation destinations—and more! Whether you’re a seasoned puzzle pro, or picking up your pencil for the first time, The Everything® Jumbo Book of Large-Print Crosswords has something for everyone to enjoy! Douglas R. Fink is the author of several crossword puzzle books, including The Everything® Large-Print Crosswords Book, The Everything® Easy Crosswords Book, and The Everything® Crosswords Challenge Book.